Waist trimmers are designed as an augment to your workout. They won’t make any difference at all if you plan to wear one while you sit on the couch. They should be worn around your waist while you work out and should fit snugly. Imagine an elastic girdle and you’ll get the idea. 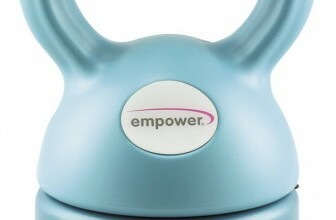 If you wear one while you workout, it will make you sweat more, thereby making you burn more calories or fat. It’s like a mini-sauna around your tummy. Some users suggest using a waist trainer is akin to a mini detox. A trimmer will also make you stand straighter and improve your posture, both of which are good things. There are a lot of waist trimmers on the market and they all make similar promises. Where should you begin your search? We have narrowed the field down to three waist trimmers we deem worth considering. In this review, we reveal the top three waist trimmers that we want you to learn more about. The Sweet Sweat Waist Trimmer increases your core temperature during exercise improving sweating and activity. This is considered by us the best waist trimmer on the market! The Sweet Sweat Waist Trimmer is our #1 pick because it really keeps its value proposition and does so with excellent quality. When used as an augment to your workout, it will make you sweat. And sweat a lot. Many users swear that it reduced inches off their waist in a matter of weeks. Further, it is backed with a 90-day guarantee so you really can’t go wrong. We also love that the Sweet Sweat comes in several sizes so you can select one that is the perfect fit for you. As we experienced with other trimmers, a one-size-fits all approach is less than ideal. This one is your best bet if you are in the market. Plus it’s stylish which is an added bonus. Learn about the size differences in product description below to customize your belt size to your unique body shape! We also really like the TNT Pro Series Waist Trimmer. It is a great waist trimmer and we recommend it without hesitation. Like the Sweet Sweat, it will also make you sweat buckets and it does an excellent job at wicking sweat away. It does the latter better than the Sweet Sweat. Many users didn’t even realize how much they sweat until they took the trimmer off. We also think it’s awesome that this trimmer comes in different sizes that will fit up to of a 60” waist. That’s the biggest waist trimmer size we could find. We only wish this trimmer’s quality was a little more impeccable. While you might not have quality issues with yours, it can be hit and miss. The quality of construction of the TNT Pro Series was inconsistent. Special anti-slip flex design to repel moisture and stress ensuring the prevention of bacteria build up and eliminating unwanted odors common with lower-quality variations. 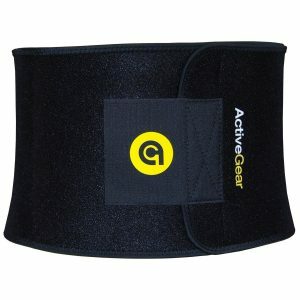 The ActiveGear Premium Waist Trimmer might be perfect for you, but the one-size-fits all approach doesn’t ring true. Some users had a hard time getting it tight enough and complained about its overall comfort as a result. That said, if it fits you, it will work well. The ActiveGear Trimmer will make you sweat. Many users claim to have achieved excellent results with this product. We also like that this trimmer is extra wide (9”) and has the added benefit of back and lumbar support even though it’s not designed with that purpose in mind. A waist trimmer is a great tool to enhance your workouts. This is particularly true if you are interested in reducing belly fat since these trimmers create a mini-sauna like effect around your mid-section. In essence they help to melt the fat away. They won’t do a thing if you are sitting around idle but even if you aren’t a gym rat, you may find them effective during housework, vigorous walks, or other types of less strenuous physical activity. They can also help with overall posture because it’s harder to slouch when you are wearing one. Further, some swear by their detoxing effects. Naturally sweating is a way to get some of the bad stuff out, so encouraging sweating is a way to enhance that. Do you absolutely need a waist trimmer? The answer is likely “no” but they may be of great benefit to you if used properly. There are a lot of waist trimmers on the market so we have narrowed the search for you. The following guide represents a great starting point as you begin to shop for yours. There are several key things you want to consider when in the market for a waist trimmer. The following elements will set you off on the right foot. Consider what the trimmer is made of. Is it going to enhance your sweat and do it in a comfortable fashion? Is it going to wick moisture away so it’s easy to wear? Consider if the waist trimmer is available in different sizes. Measure your waist as per your chosen product’s guide and purchase the appropriate size for you. It’s our experience that one-size-fits-all in a waist trimmer is not ideal. Consider the brand of the waist trimmer. Some brands are known for higher quality products than others. Also factor in whether or not the product is backed by a guarantee and whether or not it is constructed well. This is a product that will get abused so it needs to stand up to frequent use. It’s important to make sure any waist trimmer you are considering lives up to its value proposition. We can assure you that all three covered in this review do so. Take a few minutes to read the reviews of any trimmer on your “maybe” list to make sure it lives up to its promise. We consider the Sweet Sweat Waist Trimmer to be the best overall waist trimmer. The main reason we say it’s the best is because it is a high quality product and it lives up to its promise. It is also quite affordable at the $30 mark and it is worth every penny. The name of this product describes the category well. A waist trimmer is meant to make you sweat. The Sweet Sweat Trimmer promises to increase your core temperature, thereby making you sweat and reap all of the benefits that come along with it. We can assure you that this promise is true. The Sweet Sweat Trimmer definitely does what it says it’s going to do. You will sweat up a storm wearing this apparatus. We really like that it is comfortable to wear and flexes easily. 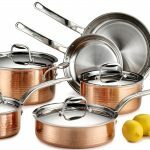 It adjusts well to different shapes and sizes although it’s important that you purchase the right waist size range for you. Having said that, we appreciate that it comes in three different sizes. Small fits waists up to 33”. Medium goes from 34” to 38”, and large works for waist sizes up to 44”. It is 8” wide, which is narrower than the other trimmers, reviewed here, but some people prefer this because it makes the product less likely to fold down when you’re moving about. This trimmer also claims to be equipped with “Neo-Sweat Technology”. This is definitely a made up term but the design is strong. It’s made from neoprene which we know is good for heat insulation and the inner lining of the belt is designed in a grid-fabric so it prevents slipping and fabric bunching as you wear it to work out. If you purchase the belt, you also get a free sample of “Sweet Sweat” to try. No it’s not a sample of someone else’s sweat. It’s actually a gel-like substance you can apply under the belt to enhance your own sweat factor. This is a nice perk. We also like that the distributor, Sports Research, backs its product with a 90-day money back guarantee. That gives you quite a while to determine if it’s the right belt for you or not. Top complaints about this product are from people who had a reaction to the neoprene fabric. They developed pretty nasty-looking, red, bumpy rashes. Not pleasant at all. These folks were definitely in the minority, and the product does include a warning about allergies but we suppose it’s tough to know if you have one. It’s obviously a good idea to wear the Sweet Sweat Trimmer for a very short period of time the first time you try it to see how you’ll react. Other users complained that the belt smelled bad but this wasn’t our general experience. We suppose it may depend on the nature or your sweat but, regardless, these complaints were in the minority. It does what it says it does – makes you sweat. 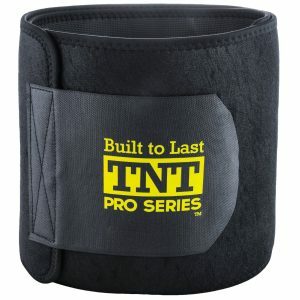 We chose the TNT Pro Series Waist Trimmer as our second pick for several reasons. We especially like that it’s available in many sizes to fit every shape and that it has great sweat absorption properties. At the $20 mark, it can’t hurt to try it. Above all, like the Sweet Sweat, it honors its value proposition. The TNT Pro Series Trimmer definitely does what it says it’s going to do. You will sweat up buckets while you have it on but you’ll be surprised at how much because you won’t really feel it. This means it is really comfortable to wear because you don’t feel sweaty. This trimmer is marketed as extra-wide (9”) to cover your entire belly, and it does that. Some users find it offers better back support than other belts, although it’s not geared to do that. It comes in five different sizes which is awesome – just make sure you measure first. The sizes extend from 32” all the way up to 60” so it’s going to fit larger frames than the Sweet Sweat does. It’s the only belt we found that accommodates a waist up to 60”. Similar to the Sweet Sweat, it also boasts an interior grid fabric to prevent slipping and bunching and it is also made from neoprene. While the belts have similar features, the TNT Pro Series does better at sweat-absorption and it does so without any stinky aroma like some users complained about the Sweet Sweat. Both will make you sweat like crazy, but the TNT Pro Series makes it less obvious while you’re working out. Because of the extra wide design of this belt, some users complain it’s too bulky and visible under clothes. We imagine this would be the case for smaller/shorter people. The same issues with neoprene sensitivity hold true with this belt. Some users reacted to it so make sure you are aware of any issues before you wear it for a prolonged period of time. Fits up to 60” waist. Overall quality of construction issues. We give the ActiveGear Waist Trimmer third prize because if it works for you, it will work well but it isn’t for everyone. It keeps its promise of making you sweat but its one-size-fits-all approach is its biggest downfall. This belt is also designed to be extra wide, like the TNT Pro Series. It comes in at 9” wide. We like that this width has the added benefit of back and lumbar support even though it’s not designed for this purpose. Its one-size-fits-all approach is great for larger people as it will fit up to a 48” waist, but this does come with some cons too which we outline in the trimmer’s weaknesses below. It is made of neoprene, like the other trimmers reviewed, and also includes an anti-slip design. The anti-slip is a must-have, but it doesn’t do this any better than the other trimmers reviewed here. 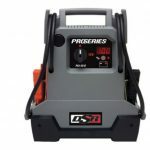 You can also buy this trimmer in a multi-pack for a discount. This sounds good on the surface, but we wonder why they are promoting the need for more than one. Shouldn’t a trimmer like this last? This offer is a bit of a double-edged sword; that is unless, of course, you want one for home and one for the gym for example. We also like that Active Gear backs its product with a 12-month money back guarantee. While 12 months seems a little excessive, it shows they stand by their product. The biggest weakness of this belt is that it is designed as one-size. It is very tough to get it tight if you are of a smaller frame size. Some people complained that it doesn’t get tight no matter how hard they pulled it. Further, the interior fabric is rubberized which not everyone loves. Some complained of a bad smell after repeated use. The extra thick band also may fold over as you workout depending on how you move and how long waisted you are. This can be uncomfortable. 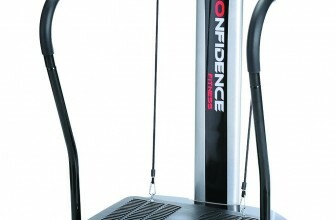 As a result, some found it fine for cardio but not so great for weight or floor workouts. Nothing that stands out relative to the other two trimmers reviewed here. One thing to consider when in the market for a waist trimmer is that some health experts indicate that any effects from a waist trimmer are not long lasting. They suggest that waist trimmers promote water loss rather than weight loss. Further, a trimmer acts to compress your torso so that alone may make you appear slimmer for a period of time. That said, the consumer reviews are hard to ignore. So many people swear that these apparatuses worked for them. Even if the results are part psychological, perhaps there is a benefit even from this angle. We just encourage you to go in with eyes wide open. You’ll still have to do the hard work, waist trimmer or not. You’ll earn it in sweat equity, one way or another. 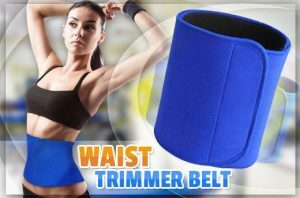 Considering that a waist trimmer is a product that you are purchasing to enhance your physique and your fitness, it is important to choose one that is comfortable and will fit your needs. After all, once purchased, you’ll be very aware of its presence and performance. The last thing you want is for it not to function the way you’d hoped or for it not to last. Each of the waist trimmers reviewed here are roughly the same price. We strongly suggest that you go for our #1 pick. The custom sizing of the Sweet Sweat is ideal and it is of superior quality. Just make sure you don’t have a neoprene sensitivity or allergy! Test any waist trimmer for a short period first just to be certain.